FYI: If you're looking to download the Harry Potter series as audio books, here's a way to get two books in the series for free, and the rest at a steep discount. In recent months, Audible (the audio books company owned by Amazon) began making Harry Potter books available for download. Now here's what you need to know: If you sign up for Audible’s 30-Day Free Trial Program, you can download two audio books for free, including two books from the Harry Potter series. Then, once the free trial is over, you can decide whether you want to become an ongoing Audible subscriber or not. Regardless of what decision you make, you can keep the two free audio books. If you remain an Audible subscriber (like I have), you can download additional books at a rate of $14.95 each. That means you can get the remaining 5 books in the Harry Potter series for $74.75 in total---which is significantly cheaper than paying $242.94, the price that Pottermore currently charges for the set. 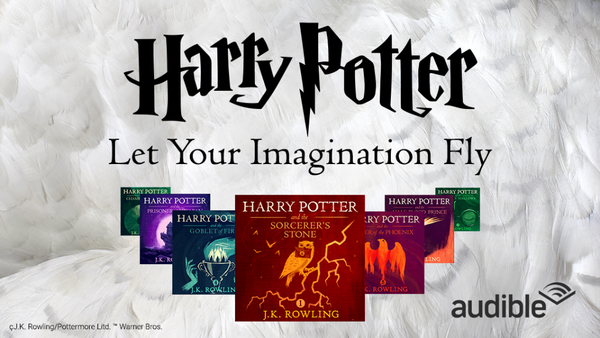 To get started, you can go to this page, sign up for Audible’s 30-Day Free Trial Program, and then download your first two Harry Potter books for free. If I have to commit so a subscription, it’s not a free download. Just to clarify, you don’t have to commit to a subscription. If you cancel before the 30 day trial is over, you can keep the downloads and not pay anything. Trying the 30-day trial and downloading the free 2 audiobooks. Hope it works. If it does, subscription at $14.95 per download is really awesome and a must-have!